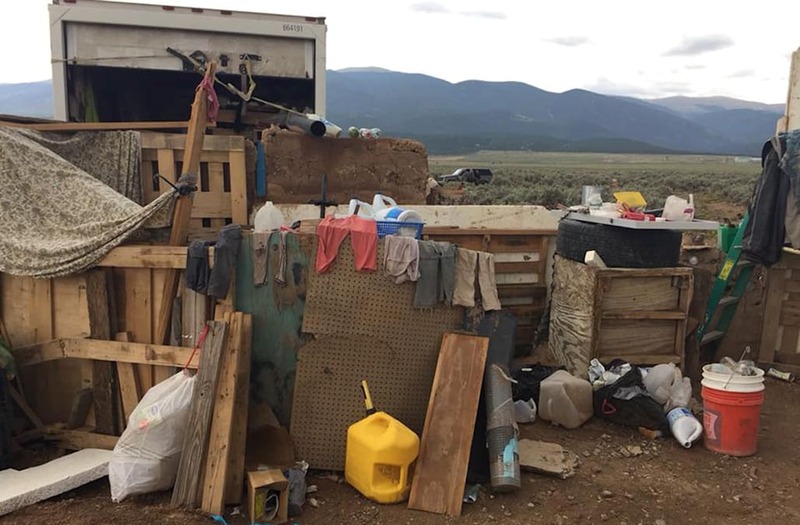 TAOS, N.M. (AP) — Three women believed to be the mothers of 11 children found hungry and living in a filthy makeshift compound in rural northern New Mexico have been arrested, following the weekend arrests of two men, authorities said Monday. Police are still are looking for 4-year-old AG Wahhaj, reported missing from Georgia's Clayton County, Hogrefe said. His birthday was Monday. The boy's mother told police he left with his father, Siraj Ibn Wahhaj, for a trip to a park and never returned. The child was 3 at the time. That changed when Georgia detectives forwarded a message to Hogrefe's office that initially had been sent to a third party, saying: "We are starving and need food and water." What authorities found was what Hogrefe called "the saddest living conditions and poverty" he has seen in 30 years on the job. Hogrefe said the adults and children had no shoes, wore dirty rags for clothing and "looked like Third World country refugees."